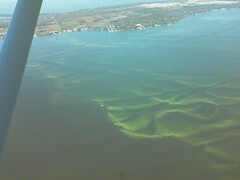 Algae on Lake Erie near Port Clinton, a photo by ladywriter47 on Flickr. A Rant: This is what pollution, chemical fertilizer in particular, does to our beautiful lake. This entry was posted in Rant, Uncategorized and tagged Lake Erie, Port Clinton, Port Clinton Ohio. Bookmark the permalink.